« Does This Make Me A Bad Knitter? It’s funny, the things we remember, and why. The “things” we attach our memories to. I’m sure, if my grandmother had given any thought (and she actually did talk about these things) about what she would like people to have to remember her by, she would have never thought of these swizzle sticks. But, to me they are special. They remind me of all the times we spent the night at Grandma and Grandpa’s when we were kids. Memories of watching Ed Sullivan and My Three Sons (REALLY aging myself here), eating ice cream on the “Davenport,” and having “mush in the morning.” Grandma always called oatmeal “mush”. And she always had the colored ice cream cones that had names on them… and when she would scoop the ice cream she would ask how big a scoop we wanted and we would all yell out “as big as our head!” Memories of Grandpa walking us down the street to 7-11 for slurpies and to pick out a candy – and my sister taking FOREVER to pick out one piece of candy. Then Grandpa would open his little rubber coin purse, the one that was always in his pocket, and as he paid he’d always say, “I’m such a pigeon.” He was a sucker for his grandkids. There was always a wishbone drying at the kitchen window from that week’s chicken dinner – waiting for us kids. In the evening, right about dinner-making time, Grandma and Grandpa would always have a “snort” of whiskey. Sometimes it was a Coors Light instead, or a glass of wine. It was always vin Rose, and Grandma would get out three wine glasses for us kids, put 7-up in them and color it with beet juice, and we could have “snorts” right along with them. Instead of vin Rose, we always called it “vin Jose”. She always added a swizzle stick. I think swizzle sticks are a thing of the past. Do places still use these? These Grandma and Grandpa had were from local restaurants, airlines, cruise lines, and the like. When Grandma died, Grandpa lived there alone for about another 10 years, and NOTHING in the house changed. It was all the way Grandma left it. After Grandpa died, we divided up the house. It was just my dad and his sister, and 7 cousins between all us kids. For a couple of days after the funeral, ALL of us (except for one cousin who lives in Alaska) went to the house and started going through all the stuff, and all the memories. We cried some, but mostly we laughed and exchanged memories. It really is one of my fondest memories – as sad as it was, it was a wonderful time. Everything in that house meant different things to different people. It wasn’t like the horror stories you hear about families fighting over the estate. We just spent days telling stories and saying, “I really remember this bedspread, do you mind if I have it?” – and on and on…. until everything was spoken for and divided up. One of the things I asked to keep was the swizzle sticks. Someone, I don’t remember who, has the picture of Grandma on the camel in the purple shirt. It was so fun to re-live all the memories of fun times with Grandma and Grandpa – and some very touching, sad, and poignant ones also. There are million stories from that day, maybe I can share more of them later. So, this little darning egg makes me sad. 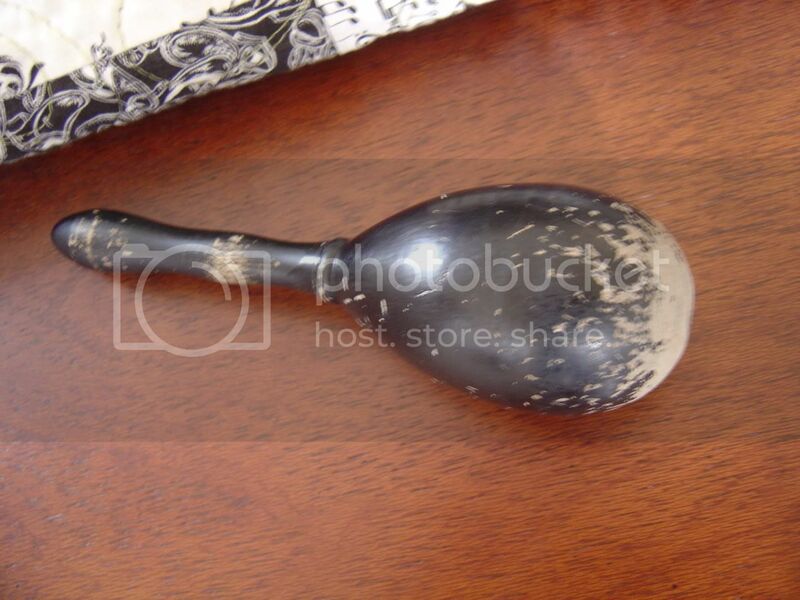 I asked my mom awhile ago to keep her eyes open for one for me – she goes to a lot of antique stores. She came back with this one. But, it probably belonged to someone’s grandma. And someone should have fond memories of it. Look at how well used it is. It used to be entirely black, but the head of it is worn off from use. I’m just sure someone saw their grandma use this hundreds of times. Why don’t they have it? Is someone wondering what happened to it? I always feel a little sad when I see things like this in an antique store. Old pictures are worse. Someone should be telling the stories- keeping the memories alive. So, I’ll keep this darning egg on my desk, and look at it fondly, and wonder who it belonged to and what her story was. I wonder what things of mine my kids and grandkids will attach memories to some day. I don’t really care – everything will mean something different to everyone – I just want them to be good memories. Lynda! You made me cry, dang it! Everytime I walk into my store, I think of my grandmother. She would have been so tickled to know that I knit. She was an amazing knitter. I used my inheritance from her estate to open the shop. Oh yes, you and I are the same. Mementoes mean so much. I remember my grandfather sneaking us out into the greenhouse before dinner (he was a florest and they lived below the shop). He had a freezer out there stocked with Nutty Buddys (I think they call them Drumsticks now) and we would sneak us each an ice cream before dinner. You know, some people just aren’t sentimental like that. Maybe the Darning Egg Family wouldn’t treasure it the way you do. I think it was meant to come live with you. what a great post! i’m all choked up over here (co-workers are looking at me funny!). it’s a blessing to have fond memories of our youths, eh? What sweet memories of your grandparents. As someone who has good memories of one set, and complicated memories of the other, I can say that memories can be so bittersweet. Swizzle sticks are still around. I saw some at a party store a couple of months ago. Everytime I see a hockey puck I think of my grandmother. Seriously. She made these whole wheat pancakes that were as hard as hockey pucks, and that’s what we called them. Hockey Puck Pancakes. That entry brought tears to my eyes. I was not fortunate enough to know my grandparents – all but one died before I was born. My grand mom from my father’s side lived in Puerto Rico but when I was small my parents were too poor to take us to visit, so my sister and I never got to know her. I always think about that. I wish I had known her. I wonder what she was like and what she liked to do. I wonder if she thought about her granddaughters in the States. I’ve grown up hearing about how grandparents are and I feel like we missed out in that kind of relationship. I, like you, would hold on to swizzle sticks and a darning egg (although I have no idea what its for). Lord knows, I have plenty of knick knacks tucked away in a trunk I own, each with its own memory. One of the reasons why I have always wanted to learn to knit is to have something “special” to pass on to my children, if God so deems for me to be a mom someday. Thanks for sharing that thought. I really enjoyed it! What a great post! It brought back memories for me of my grandparents, especially my grandfather. He lived in California (Mountain View) for a long time, and had a brother who lived in Lake Tahoe. He had a lot of those swizzle sticks, plus ashtrays and bar glasses, from Harrah’s and the like. What a lovely post! Thanks for sharing the swizzle stick story and the darning egg with us. Lovely post, Lynda. I love all my grandparents, but one grandma spent hours and hours with us cousins. We did projects, took long walks, miniature golfed, helped her in the kitchen. One of my earliest memories is her reading to me through an oxygen tent while I was hospitalized with pneumonia in 1st grade. Precious memories you’ve dug up, Lynda. Thank you. Very nice post, Lynda! Two of the things I remember the most are a red pitcher that was shaped like the “Hey, Kool-Aid!” guy and tall aluminum tumblers that came in different bright metallic colors. We loved having Kool-Aid, but always asked if we could have some of Grandpa’s iced tea. It was dark, dark, dark and sweet, sweet, sweet. It was also usually off-limits! I enjoyed reading your memories about your grandparents. What I recall the most about my grandmother (she was 101 when she died) were her sayings – like Whenever someone said they appreciated her or something she had done, she would reply – “well I appreciate your appreciation”or when she had to go to the bathroom, she would say, “I need to wipe the dew off my lily.” She was quite a character. Davenport!!! Your post took me right back to my great-grandparents’ house. Saturday night was Lawrence Welk and Hee Haw…on the jalocee (sp) porch (I understand now that they are the type of window–today, we’d call it a sunroom). Right before bed we’d have a bowl of cereal or Eskimo pies while sitting on Charles Chip potato chip cans in the kitchen. Breakfast included home delivered milk with an inch of cream floating on the top–so yeah, I’m thinking we’re of an age, as they say :o) Trips down memory lane are so much fun! What great memories. I was just metioning to my mom yesterday morning; I hope I can recall all the memories that my grandparents left for me. I think the more we talk about them, the more they stay with us. Aw, that was so sweet Lynda. It’s good you can remember all that stuff. I can’t even remember where I sat my glasses half the time! I remember the ol’ wishbone thing too, my grandma used to do that for us. Now you’re making me need to call my grandma. I love your darning egg thingie. Great Post!!! Its funny what we remember from when we where kids. I can remember having tea parties with my Grandma, my Grandpa telling me stories, and soo many more!! Crying… but you are so right! Blessed are you for you for knowing these things and blessed are we when you write about them. This is such a beautifully written post – and so appropriate for Father’s Day weekend. Thank you for sharing these memories with us. I read this wonderful post right after writing about my dad on this first father’s day without him. I often have the same thoughts about the memories my family will have when I am gone. Amy has a knitting legacy and I have a crocheting one – my grandmother was a crocheter and quilter. I treasure the little snip style scissors she used in her work. Thanks for sharing! I was born late to my parents (they were 40 & 44) so my grandparents were all pretty old when I was a kid and I lost 2 of them early on. Mom’s parents – Grandpa was in a wheelchair and I don’t have too many memories of him – but Grandma hand-pieced quilts and “dipped” snuff. That is a powdered tobacco for those of you who don’t know, that used to come in these little clear glasses with a tin lid. Our family had LOTS of little glasses – grandma shared!! She always had an old tin can with tissue at the bottom of it for a spitoon and always carried a hanky. She was a saint of a woman with that one little tiny vice! Dad’s parents – grandma died when I was a kid, used to bake pies. My favorite was Caramel with egg white “frosting”. Sadly, none of her family ever got the recipe out of grandma’s head. I remember my grandpa smoked cigars and would sit on the front porch and smoke and sing little “ditties”. I was about 5 or 6 and he would pay me a quarter to dance while he sang! I was his favorite out of the youngest grandkids. So whenever I smell a cigar or pipe I think of him!! I think our next women’s retreat is going to have a “memories” theme. Thanks for jogging my memories! That was so sweet to read. I really miss my grandparents now. My grandpa was an awesome dancer, and he taught my mom to knit and crochet! Then, she taught me. He was almost 95 when he died, and he was still dancing! He won a lot of competitions. Family and good memories are so important. I hope my kids remember lots of good stuff when they are grown. I really enjoyed reading your blog post today. Those happy memories are the things which keep our loved ones alive for us. I have a blanket which my mum made when I was little which I treasure because it reminds me of her and all the garments she’d knitted and crocheted out of the same wool. Whenever I miss her, I wrap myself in the blanket and feel like she’s giving me a hug. i have my grandmothers sewing machine, and my other grandmother’s hand mirror. i totally get it. good for you keeping th eswizzle sticks. my step mom always wants to throw the old junk out and it just pisses me off! Hang on to that darning egg. It will come in handy when you need to darn one of your beautiful socks. Of course, the Yarn Harlot darns socks by holding them carefully over the trash can and saying “Darn” as she drops them in. Those are dear memories. 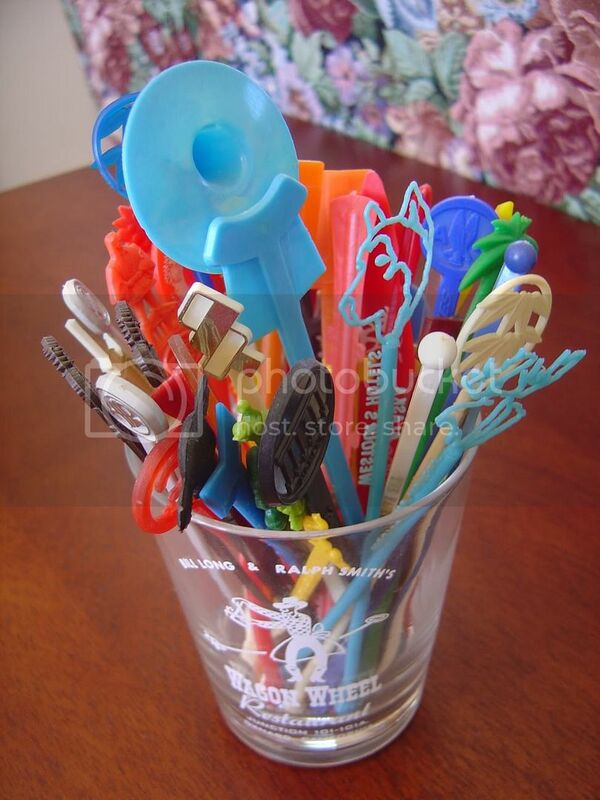 It’s funny, just seeing those swizzle sticks reminded me of when I was little and got to go to fire-hall functions with my parents, when everyone’s drink came with a little plastic donkey, or mermaid or giraffe perched on the rim! I would collect all that I could and hope to get them in each color. A few years ago, I found some at Target and when Jon J and Augie come to visit, they always want an animal on thier cup! Thats a really great post. 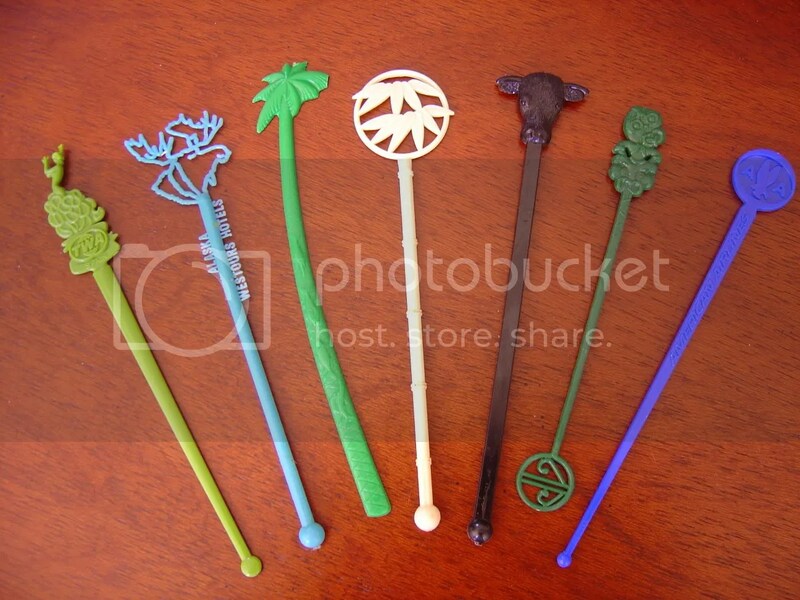 I enjoyed hearing the stories behind those swizzle sticks. Fantastic memories.